"Goodwood's not for a while yet," said a colleague as I ambled into the Donington paddock for the Richard Seaman Memorial Trophy Meeting. Well, yes, there's no formal request to put on period togs and pretend to be Bertie Wooster at any of the other historic meetings of the yearÉ it's just something that happens. The event is one of several sizeable jamborees held annually by the Vintage Sports Car Club, the self-styled last bastion of all things tweedy and lubricated by Castrol R. There are Bentleys and Morgans and Connaughts by the score, while the commentary bubbles along with lively debate over the merits of side valve as opposed to overhead. There is a tangible sense, when walking through the paddock, that if you don't know all the words to the Eton Boat Song you might well be de-bagged and beaten on the bottom with a leather bound copy of Winnie the Pooh. Hard to imagine, but these are the kind of folk who ran the British Grand Prix until last year, when B.C. Ecclestone (as he is still known in such circles, remembered from the entry lists of his days of racing 500cc Formula 3 Coopers), took exception to their quaint amateurism. Actually B.C. had tired of quaint amateurism even when he was at the wheel of his little Cooper, but not until the car parks at Silverstone took on the appearance of Passchendaele was it overthrown for a culture of marketing mixes, brand loyalty and the belief that all the world's ills can be cured by synergy. As corporate babble takes an increasing hold, stepping back in time for the day comes as a refreshing change. I wasn't alone in choosing traditional garb. Straw hats and cravats, blazers, school ties and picnic hampers abounded throughout the paddock. It's harmless fun: a recreation of what might have been. Even the stars of the weekend - the fearsome Auto Unions - were facsimiles. Nobody cared. 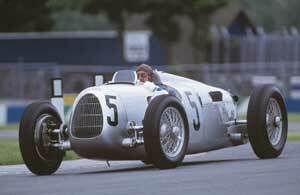 The air around Donington reverberated to a bespoke Auto Union V16 for the first time since Bernd Rosemeyer's victory in '37, albeit without its trademark stink because Audi elected to ditch the old rocket fuel mixture (alcohol, benzol, ether and sundry other combustibles), and instead built the 6-liter to run on regular unleaded. Shame, then, that even though they were a couple of years old the 200 mph, tire shredding potential of the Silver Arrows wasn't in evidence. I've seen more aggressive driving in a car park. Mixing youth and vigor with old-fashioned style is, though, doing big business. In London's West End the musical Chicago, is busting blocks and filling the pews of theaterland with its homage to pre-war femmes fatale - a field in which, as Auto Union and Mercedes dominated in Grands Prix, so Marlene Dietrich kept Germany firmly in front. If Dietrich were still among us however she'd be completely and utterly lost on Chicago, even though the entire show was written with the very essence of her in mind. She'd have been 100 this year for a start, and it was sad enough to see the grande dame tottering through the Sixties under a wonky platinum wig. The old girl's role has therefore been filled by Denise van Outen, former princess of innuendo on Britain's breakfast TV who's currently stopping traffic as she glowers, Marlene-like, from the billboards. Mixing glacial cheekbones with Britney Spears hemlines evidently stirs the same passion for the 1930s in theatricals that the recreated Auto Unions do in petrolheads; a modern day Dietrich who runs on unleaded. West End shows and club races at Donington do though pale a little with Monaco on the horizon; a living, breathing piece of those alluring days gone by that is our one chance of the year to see the likes of Heinz-Harald Frentzen hustle through corners once graced by Chiron and Varzi. You can see, too, how the gulf between then and now grows wider each year. Back then Monaco was often a wheel-to-wheel race, but overtaking maneuvers in recent decades can be counted on the fingers of one hand. If the on-track action is a little different, however, then the paddock is unrecognizable. The touchy-feely world of modern F1 sees little Hugo Hakkinen making Hello! style headlines as the paddock ponders whether or not Monaco isn't a little bit too dangerous for modern cars. More importantly it's a long walk between the trucks, the pits and the motorhome. The teams find Monaco a chore because they have to design almost entirely new cars to cope with the principality's streets - with this year's fad for extra nose wings quite the most heinous crime against the sport for many years. That being the case, why don't they all follow Audi's lead and produce really suitable cars... old ones? For the style gurus and the beautiful people it would be the final polish, while for petrolheads it would be heaven as the sights and sounds that fuelled a million boyhood fantasies are restored (strictly unleaded of course). I'm sure that all the chaps would agree quite how topping it would be to race side by side through the Station - sorry, Loews - hairpinÉ with team orders netting massed raspberry-blowing in reply in time honored fashion. Meanwhile with Montoya sporting a nomex bow tie, the press corps should be smothered in Brylcream and the team PR girls equipped with fur stoles. Jacques Villeneuve might even shave for the occasion. I'm sure that somebody enterprising (doubtless Eddie Jordan), would even bring over Ms. van Outen and her Chicago troupe to perform Razzle Dazzle on his yacht, indubitably providing those rakish rogues DC and Eddie Irvine with a little off-track competition to boot. "One scarcely knows which is the most astonishing feature: the number, alas! only too rare these days, of true racing cars, the novelty of a high-speed race through a city, the gathering of Europe's most famous drivers in a single contest, or the variety of countries from which hail the men who will fight out this epic under a Mediterranean sky."